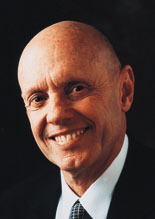 Recognized as one of America's 25 most influential individuals by Time magazine, Stephen R. Covey (MBA '57) is the author of The 7 Habits of Highly Effective People, which has sold more than 10 million copies in 28 languages in 40 countries. Cochairman of the Utah-based Franklin Covey Co., he recently published The 7 Habits of Highly Effective Families. Writer Orna Feldman recently spoke with Covey. What explains the success of your 7 Habits books? Pain. People have broken relationships. They live in a mistrustful culture. Their lives are out of balance. So people respond to the fundamental principles we espouse for taking control of one's life - steps such as being proactive, putting first things first, and establishing clearly what you want to achieve. The universality of these principles resonates with people. Which habit have you found the most difficult for companies to achieve? Habit 5, which is "Seek first to understand, then to be understood." Most people listen with the intent to reply, not to understand. Once people think they know and stop listening, they're no longer dealing with reality and so their prescriptions are doomed to be off target. That's what ails a lot of businesses in this country. Without listening, the organization (and its stakeholders) can't properly adapt to customers or the marketplace. How do you motivate business leaders who are not good listeners to become so? Force of circumstance is a powerful motivator: if they don't listen, they don't survive. Another force is unsatisfactory personal relationships. I asked a CEO of a major multinational why he had his 35,000 employees trained in the 7 Habits. He said, "My wife had told me I didn't listen to our daughter." After he honed his listening skills, he and his daughter grew closer, and he realized the value of listening as applied to business. You call one of your habits "sharpening the saw," or taking the time to reflect and renew the self. How do you convince Type-A people to do that? With great difficulty. The Western personality is action-oriented. People feel uneasy, even guilty, about taking the time for reflection, careful analysis, or long-term planning. Many actually get turned on by "firefighting" and crises; they have an emergency addiction. But when people compromise their integrity and burn themselves out, they experience loss in every area of their lives, including their health and relationships. It's then they often become more disposed to change. In recent years, what's been the most positive development in business? The global economy. "Excellence" in local or regional terms is usually a limited concept. True excellence doesn't begin to emerge until you have to compete at a global level and maintain a world-class standard of quality. What's the biggest shortcoming of American business? Its low-trust culture, characterized by defensive and protective communication, hidden agendas, internal politics, and underutilized human talent. When I address audiences, they routinely tell me that 90 percent of the people in their organization have more creative ability, talent, resourcefulness, and intelligence than their present jobs require or allow. People also tell me they spend far too much time dealing with defensive communication, personal conflicts, and interdepartmental rivalries. That's the high cost of low trust. What can be done about this trust problem? Companies have to change their paradigms and recognize the overriding importance of trust. The only thing that can build trust is trustworthiness, which comes from always living - or conducting business - according to certain principles: honesty, integrity, respect, kindness, meaningful work, fairness, and justice. These are the classic, self-evident principles we incorporate into our 7 Habits; we believe they are fundamental to creating a positive paradigm, either in an organizational context or in a person's life.